The recruiting class is rated No. 14 in the country by espnW HoopGurlz. 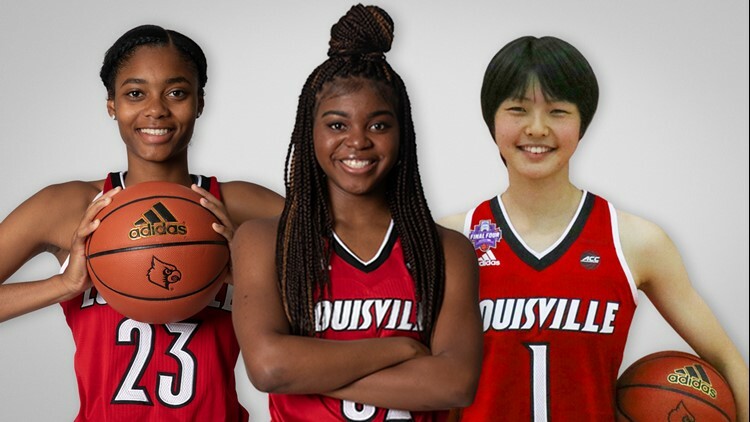 LOUISVILLE, Ky. – University of Louisville women's basketball head coach Jeff Walz and his staff announced today that they have signed three top players for their 2019 class. Nyah Green, a 6-foot-1 guard from Allen, Texas, Ramani Parker, a 6-4 forward from Fresno, Calif., and Norika Konno, a 5-foot-10 guard from Sendai, Japan, have signed National Letters of Intent with the Louisville women's basketball program. "We are thrilled to announce our 2019 signing class," said Walz. "We've proven year after year that we will travel wherever necessary to find players that are a fit for our program. To get Nyah from Texas, Ramani from California and Norika from Japan is very exciting, and I can't wait for our fans to get a chance to watch them play." The recruiting class is rated No. 14 in the country, according to espnW HoopGurlz, and it marks the eighth time in the last 10 years that the Cardinals' coaching staff has compiled a top 15 class. Last season, Louisville brought in three in-state players with Molly Lockhart, Seygan Robins and Mykasa Robinson for the No. 13 class in the nation. In the spring, the Cardinals later added graduate transfer Yacine Diop. The Cardinals welcomed the No. 6 class in 2016 and the No. 1 class in 2015. Overall, Walz and his staff have signed nine McDonald's All-Americans – with this year's honorees still yet to be announced. Nyah Green comes to Louisville as the No. 12-ranked player in the class of 2019, according to espnW HoopGurlz. The five-star prospect is tabbed as the seventh-best player at the guard position. She is ranked seventh overall and as the third-best guard by Prospects Nation. She led Bishop Lynch to a TAPPS 6A state runner-up last season, averaging 18.7 points, 8.0 rebounds and 2.1 assists in 37 games. At the conclusion of the season, she was named TAPPS 1-6A MVP and MaxPreps High School Girls Basketball All-American Team honorable mention. She averaged 14.9 points and 5.0 rebounds as a sophomore when Bishop Lynch won the TAPPS 6A state championship. She was a first-team all-state selection. Green is transferring to Allen High School for her senior season, the school she attended as a freshman. She is on the Citizen Naismith High School Girls' Watch List. Green chose Louisville over LSU, Baylor, South Carolina and Tennessee. Ramani Parker is a four-star prospect and is ranked 99th overall in the class of 2019, according to espnW HoopGurlz. She is rated No. 13 at the forward position by espnW. She is rated 29th overall and as the seventh-best forward by Prospects Nation. Parker played for Central High School in Fresno, Calif., before transferring to Montverde Academy in Montverde, Fla., for her senior season. She chose Louisville over Stanford, UCLA, Notre Dame, Michigan, Duke, Ohio State and Oregon State, Baylor and South Carolina. Norika Konno is a 5-foot-10 shooting guard from Seiwa High School in Sendai, Japan, and has an impressive resume of international experience. In early November, she was a member of the Japanese National Team and helped the team win a silver medal at the U18 Women's Asian Championships. With the second place finish, Japan qualified for the world championships next summer in Thailand. She recorded 10-plus points in four of five games, including 19 points on 8-of-12 shooting, vs. China. She finished the tournament averaging 13.0 points, 4.0 rebounds and 2.5 assists per game. She was also a member of the 3-on-3 team from Japan that won a silver medal this past summer in the 2018 Asian Games. In her best game during the tournament, she had 28 points, nine rebounds, three assists and three steals. For the latest on Louisville women's basketball, visit GoCards.com, or follow the team's Twitter account at @UofLWBB or on Facebook at facebook.com/UofLWBB.